and the worst thing you can do is nothing." I have decided I've been messing around with a new blog long enough. Since I do not have my own computer with my collection of photos and inspirational quotes I was getting nowhere with a design I liked. Thus I made a 2nd decision - to come back to the place I started and feel comfortable - with a few changes! The first and most evident change is the color. It is pink isn't it? Pepto-Bismal pink! According to my friend Dani who knows about these things, pink is the color associated with unconditional love. Since I've been having some difficulty lately in the feeling lovable department, Dani suggested I surround myself in pink. Pink is not a color I would normally choose for myself but I decided to try it. I wore a pink sweater to church last week and was surprised at the number of comments I got on how pretty I looked. Pretty in pink, hmmmm. This blog is where I come to open myself up, to be vulnerable. It makes sense, then, to have it be a place of unconditional love for the person who writes it and the people who read it. Stepping out my blue and green comfort zone I painted my blog pink. Along with the color I added some verbiage to the sidebars. As is often the case I may have gotten a little long winded. That might have to do with the fact that I haven't been writing for a few weeks and given the chance I let the muse loose! Now about my computer. It still lies in a coma awaiting for technical attention. Son of Sweetie seems to think he can bring it back to life with a new hard drive. However, my computer woes do not sit at the top of his priority list. I understand that and am working on perfecting the virtue of patience. I don't guess there is any way of knowing what caused the problem(s). I've come to the conclusion it makes very little difference. I stand at the proverbial crossroads, either we make the thing work or give it a proper burial. I'll be okay with whatever happens. In the mean time I've been using my father's computer to check my email and others' blogs. It does not appear to be infected. Last night I came back to this blog and noticed several comments on my last two posts. My heart did the happy dance. I felt loved and missed. Right there and then I decided to give up working on a new blog and came home where I belong. Thanks to all of you who have stayed with me and encouraged me to keep writing. I see now how important it is to my peace of mind to have a place I can run to and speak (or write as the case may be) my truth. I know it's been awhile since I've posted on this blog. I've even set up another blog. Which means I now have two blogs, two user names, two email addresses and 2 passwords, but no computer. Need I mention that this is all very confusing to me? The computer thing is going on way too long. Occasionally I check emails on my Dad's computer. I've been afraid to blog because I have blamed the demise of my old computer on something coming in through the comment section. True or not? I don't know. Son of Sweetie has offered to help me make the decision to repair or replace the computer. Trouble is Son of Sweetie has a lot on his plate right now so I'm not rushing him. I decided to post tonight for two reasons. I left some comments on some of my favorite blogs not realizing the new blog name would come up. Who's going to know that "Poetry & Hums" is actually Merry ME? Well, if you are wondering it really is me. I haven't decided if I'm going to start a whole new blog or just change the name. I'm also not sure if I can combine the two. But it seems if I did that I would be defeating the purpose wouldn't I? I hope to have it all straightened out by the time I'm back up and running. The second reason to post is because I watched this incredible documentary today. Pray the Devil Back to Hell. While I was safe in my home, ironing, I watched as hundreds of Liberian Women joined ranks and formed a coalition for peace in their war-torn country. It was an eye opeing movie. Hard to watch yet inspiring. I felt sickened at what I saw and heard and my heart beat fast fearing for the brave women. But they held their ground. They demanded peace so their babies could sleep at night, so their daughters and sisters and mothers would no longer be raped, so their sons could put down their arms and learn a new way to live. I am embarrassed to admit that years of war raging in African countries has had little affect on my life. I'm literally fat, dumb and happy. The thing is, even though it's on a much smaller scale, right here in Florida where I live, mothers have the same fears. When I watched the Liberian women I thought about an older black woman who used to go to our church. She was Liberian, a nurse.She wore big beautiful hats and colorful scarf headpieces. She always sat in the first seat of the first row - where my Dad and I sit now. I don't know how long she'd lived in this country. But she went back to Liberia occasionally and took supplies and bibles that the church collected. She died during her last trip home. I thought about her as I watched the movie and believe if she'd been there at the time, she would have been one of the women sitting in the marketplace with a peace placard. If you haven't seen this movie I urge you to rent it. I wonder what would happen in this world if every woman rose up and said simply ... NO MORE WAR. WE DEMAND PEACE NOW! I doubt I'd be brave enough to stand alone, but I totally believe in the power of a united sistershood. May you go to sleep tonight knowing that you are safe from war and hunger and thirst. I'm sad to report that the computer gremlins are still at work. They are not only wreaking havoc with my computer but slowly driving me to the point of despair, if not madness. Perhaps both. I've tried telling myself in the light of REAL world problems having or not having a computer that works is not even on the horizon. That said, I'm sad, mad, frustrated, weepy and generally not nice to be around. I don't know what I'll do, but I think I'll close this little baby up and forget about it for awhile. I hope that doesn't mean I'll be completely out of communication or not. There is always snail mail - a rather delightful alternative I must say. As for blogging, journaling and/or ranting, I guess I'll get myself a new retractable sharpie and a composition book and pretend I'm Laura Ingalls Wilder (except for the Sharpie, of course). Sweetie has been re-visiting the Law of Attraction, et al. I wonder what sin I committed in another lifetime to attract this malaise. I know I'm way too full of drama - even for me to listen to, so I'll say au revoir, til we meet again, and good night. Okay, so I go to post my last entry and I get some kind of message about HTML not accepting META. And the font is definitely different from before, although I keep telling it I want the "normal" sized Times. The first line of the text (not the quote which I copied from word and may be the "META" culprit) either remains italicized or a different font. Just when I was feeling all's right with the world, I feel my blood pressure rising. Clearly I'm techno challenged and trying to remedy that situation at midnight is not the wisest course of action. I'm going to tuck my computer and myself in. I'm sure everything will look different in the light of a new day. it's making a great deal of the little ones." I'm baaaaack! It feels like I've been gone forever! I thought my moodiness was because my computer was broken. Sweetie suggested I was missing my blog! He may be right. There is no explanation as to what exactly happened to my computer. When the geek from the Geek Squad told me there was nothing - NOTHING - left on my hard drive, I felt physically ill.
What to do? Pay to have it fixed? Throw the thing in the garbage can and turn myself into a rehab hospital for computer detox? Buy a new one and start over again? Cry? Throw myself in front of a Mack truck? Bite someone's head off? Pray? All of the above? Saner minds prevailed. Sweetie called Son of Sweetie, and within 48 hours I was back in business. There are still a few personal programs I have to re-install but that will happen in the next few days. For now, I'm just rejoicing in the warmth and beauty of my silver friend. I've said it before and I'll undoubtedly say it again, I love birthdays. For lots of reasons, but mainly because it's the one day a year that it's socially acceptable to say, "Hey world, Look at me!" And even if you throw caution to the wind and act in ways that your friends and family might look down their noses at on other days, on your birthday you can pretty much get away with anything. I feel sorry for people who have birthdays right around Christmas. How could they not get cheated out of the wonder of one or the other? I think December birthdays are the perfect excuse to celebrate an "un-birthday" at another time of the birthday person's choosing. And perhaps, in the years ahead, that's exactly what Miss Ivy Jane Wichansky will choose to do. However, on the first day of the new year, in the new decade IJ turned two. I was not there to greet her on the day she was born, nor anywhere near on her following birth anniversaries. I have to enjoy this little beauty from afar. When I got his photo of the Birthday Queen I immediately felt that IJ epitomized how I feel about birthdays. Look how she closes her eyes as if to enhance the chocolaty goodness of food fit not only for the gods but for curly haired birthday girls. 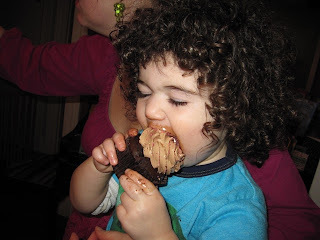 It almost makes me want to give myself a perm and dive into a vat of chocolate frosting. I'm late in saying it, but Happy Birthday Ivy Jane! May your life always be full of the things that bring you great joy. P.S. That quote might be one of my all time favorites. an ever-fresh and radiant possibility. The 4th annual Guild of the Christ Child Baby Shower was held today and I must say I was pleasantly pleased with the way it turned out. It's getting harder to spend time away from home for extended periods of time, so I don't feel like I've given this event the attention it deserved. I told Sweetie I felt like a slacker. There have been many days in the past month that I chose not to think about the things that needed to get done, rather than have the discussion about how long I'd be gone. Kind of twist on the head in the sand theory. The problem is the party day was rapidly approaching. The time crunch called for me to go way out of my comfort zone and ask people for help. Plus, I didn't have much time to give them any direction, i.e. my way. All I could do was ask, "would you?" and left it at that. OMG, you wouldn't believe how people came through. Two people were in the kitchen from 8am-2pm. 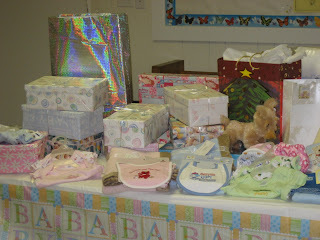 The gift table was laden with baby items. The church was still decorated for Christmas so it looked beautiful. The service was perfect; two women priests on the altar was just what the event called for. 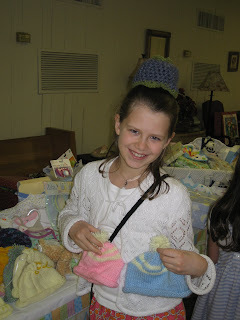 One of the highlights for me was getting to meet a young girl (11) who has been knitting baby hats since last year. I'm not only impressed with her generous spirit, but with her knitting skills. The stylish hats she created far surpassed their utilitarian use. Once again I am overwhelmed by the kindness and generosity of people. My humble idea has turned into something that has far-reaching affects. Knowing that the gifts we collected will go to the neediest of needy increases the blessings. I get all goose bumpy when I think of Native American babies living in hogans with no water or electricity being wrapped in a handmade blanket made by a woman who has been sewing for this cause since last January. Sweetie and I had a conversation yesterday. He wants me to re-train myself so that I no longer decline every compliment that comes my way. Just say "thank you" is my new mantra! It's kind of a new concept for me - accepting that I am deserving of a compliment. When I got home this afternoon, after being gone most of the day, I told Dad how wonderful everything was. "I'm proud of you," he said, instead of "you were gone long enough ...."
I new exactly how to respond. "Thank you," rolled off my lips like I meant it. Maybe you can teach an old dog new tricks! Wishing for you gifts from the heart and the knowledge that you, too, are worthy. I have absolutely no idea what was wrong with my computer, if it has been remedied, or if it will crap out on me in the next second. In whatever window of opportunity I have, I wish us all God's speed as we start a new year and a new decade. The slate has been wiped clean. We are invited to make a mark. Will it big and bold? Or simply initials in an unseen corner- a reminder that we were here? What lies in front of us? What adventures await? What roads will we take? Will we travel the path that others have made, or strike out on our own? Last summer my blog friend took the picture I put on my header. (Hope that's okay, Sorrow!) I love its simplicity, though I seem to remember the actual taking of the picture was a bit of an adventure. The photo seems appropriate for the beginning of a new year. Standing at the gate, one can go forward (toward the ocean) or back (to something unseen). Wide open and full of promise, the beach beckons. Yet, like taking off our shoes before crossing the sand to dip our toes in the ocean, must we leave some excess baggage at the gate? When the clock strikes 12, will join with me as I head towards the ocean? Don't look back, it's a brand new day. I have resolved to make no resolutions. Instead I want to savor each day as it comes and crawl into bed each night with a grateful heart. For each of you, and for me, my prayer is for a life rich with joy and a world at peace.